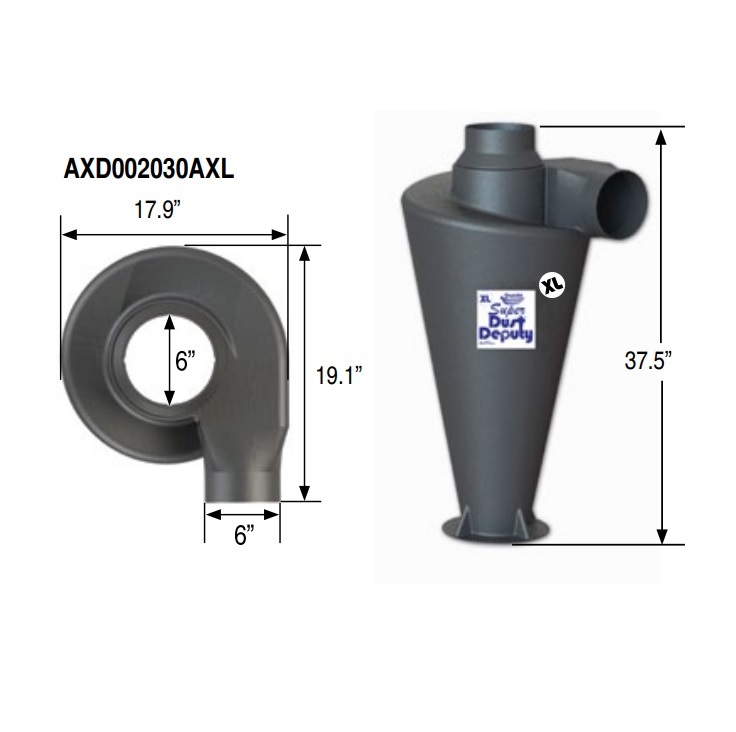 Super Dust Deputy XL 152mm (6inch) DIY Cyclone Separator | DamenCNC B.V.
Standard wet/dry vacuums rely on a filter only to separate dust particles. The filter becomes clogged rapidly and the vacuum's airflow is reduced. This is especially true for applications creating a large volume of dust. How do you know when it is time to clean the filter? And then, once you do clean it you know you have just a short amount of time before your suction is reduced again. What is the Dust Deputy®? The Dust Deputy® is an extremely efficient, cyclonic pre-separator for vacuums. Trap dust in the barrel and NOT in your vacuum. 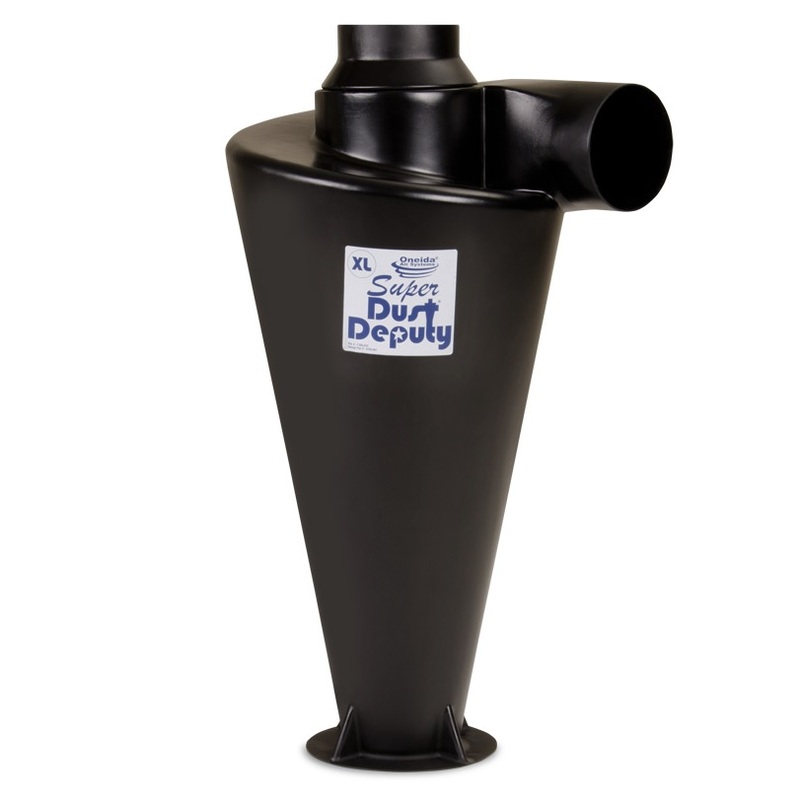 The Dust Deputy® will filter 99% of sanding dust, with only 1% going into the vacuum. Injection molded from static dissipating plastic, you now have even more options of mounting it in your shop, and easier hose connections with the tapered inlet and outlet (2" inner diameters). 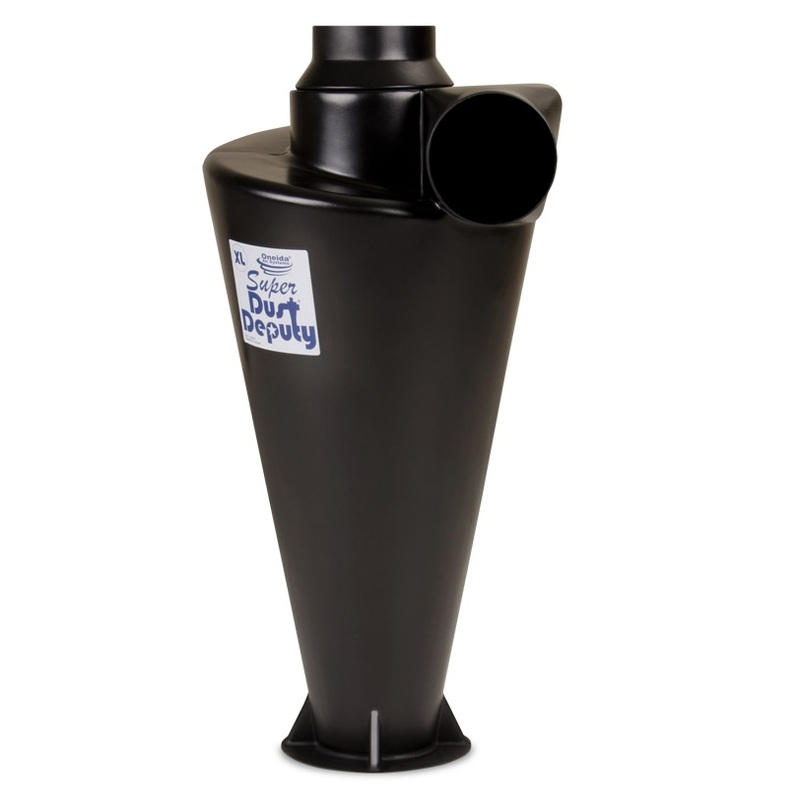 Added to your existing wet/dry vacuum, it uses centrifugal force to literally spin the material being conveyed right out of the airstream, and into the bucket. 99% of the material NEVER reaches your wet/dry vacuum's filter! That means longer life for your wet/dry vacuum filter, as well as your vacuum... that translates into savings on replacements. Maintain maximum suction, no loss in airflow, and an end to clogged filters! The tapered inlet and outlet accomodates different sized hoses and couplings without the hassle of hunting for the right size connection. 1.Increased Suction Power: Most wet/dry vacuums clog up rapidly. With most of the waste getting trapped in the Dust Deputy's drum, the filters stay cleaner and power drop-off is much less. 2. Fine Dust Separation: Most wet/dry vacuums can't capture the finest dust which is the most harmful. By retrofitting the Cleanstream® HEPA filter to your vacuum, you can capture 99.97% of the remaining waste down to .3 microns. 3. Longer Life: With less filter loading you'll get longer filter life. 4. Easier Emptying: Now you can easily dump the dust out of the bucket without having to even open your vacuum. 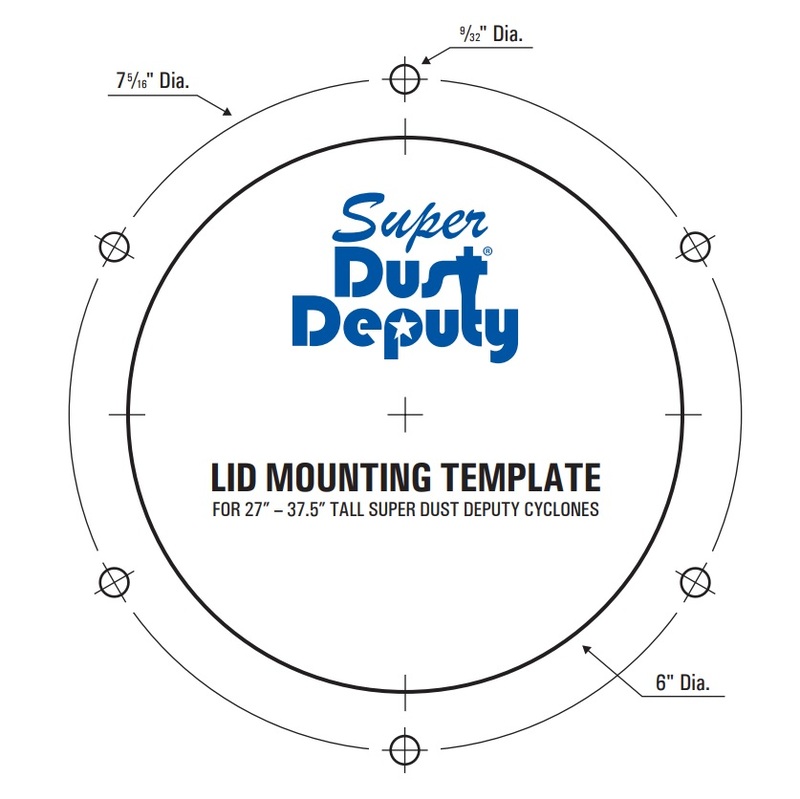 What can I use the Dust Deputy® for? We have thousands of customers using our patented design with great success for a variety of applications: Wood dust • sanding dust • drywall dust • clay dust • concrete dust • bakery/flour dust • panel saws • dental laboratories • anthropology laboratories • corn stoves • pet grooming • central vacuum systems... the list goes on and on. The Dust Deputy® benefits anyone with a wet/dry vacuum, not just woodworkers. And yes, The Dust Deputy® even works with water!